Robin's Barn (Self-catering cottage) Wye Self-cateringRobin's Barn is situated in an idyllic, rural setting in a designated area of Outstanding Natural Beauty. The two bedroom barn conversion features a spiral staircase, oak beams and woodburner. 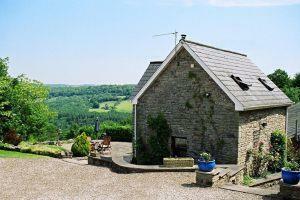 It enjoys beautiful views over the Wye Valley and beyond to Offa's Dyke and the Forest of Dean. The whole area is an unspoilt haven for wildlife. with deer, badgers, foxes buzzards, owls and woodpeckers being regular visitors! Robin's Barn boasts lovely walking from the door with both Offa's Dyke Path and the Wye Valley River walk, a good pub and an excellent restaurant all within walking distance. Heating and electricity are included in the summer months. Small additional charge during the winter. Robin's Barn is situated in an idyllic, rural setting in a designated area of Outstanding Natural Beauty. The two bedroom barn conversion features a spiral staircase, oak beams and woodburner. It enjoys beautiful views over the Wye Valley and beyond to Offa's Dyke and the Forest of Dean. The whole area is an unspoilt haven for wildlife. with deer, badgers, foxes buzzards, owls and woodpeckers being regular visitors! Heating and electricity are included in the summer months. Small additional charge during the winter. FREE Wifi now available Children welcome from age 4. The nearest bus stop is one mile away and provides a service to Monmouth and Chepstow. Nearest train station is in Abergavenny, half an hour drive away.